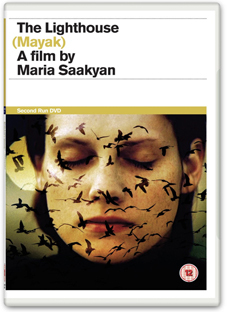 Maria Saakyan's elegiac, semi-autobiographical, humanist drama The Lighthouse (Mayak) unfolds against the backdrop of the Caucasus wars that plagued Georgia, Armenia, and Azerbaijan during the early 1990s. Told with a dream-like emphasis on vision and sound this is the story of a young woman, Lena (Anna Kapaleva), who returns to her home in a remote, war-ravaged Armenian village to try and persuade her grandparents to leave with her for safety in Moscow. With a striking emphasis on the cinematic image and set to an hypnotic soundtrack by Finnish composer Kimmo Pohjonen, Lena's return to her homeland combines documentary with the great visual tradition of the cinema of Tarkovsky and Paradjanov to become a poetic journey of discovery. An outstanding directorial debut, and an immensely moving experience. Described by S.F. Siad in Sight & Sound as "An incendiary mix of war film, memoir and musical explosion, it was hands-down the debut of the year, standout of the London Film Festival 2007," The Lighthouse will be released on UK DVD on 11th April 2011 by Second Run at the RRP of £12.99. Extended booklet featuring a new interview with director Maria Saakyan, and new essays by author and poet Sophie Mayer and film and art historian Vigen Galstyan.